When you decide on which training to book, take a look at our offers below and decide which of them you'd like to take advantage of. Download your 60 page Aesthetic Competency Tool Free of charge here today. 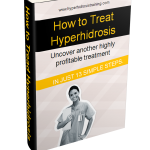 Buy your quick step by step guide to treating Underarm Hyperhidrosis. Lots of people find that ordering the right amount of consumables, the types of consumables and know the quantities to order is a hindrence to getting them started. So we have made up a Sample Kit to help you decide which consumables to help you to get off on the right foot from the moment you leave us. Simply organise your insurance to start the day after your training and your free to start your treatments straight away, especially if you upgrade to any of the product starter kits too. This is a fantastic kit to keep your momentum going after completing your training. We have the perfect amount of consumables to get your first clinic up and running. With a lockable aluminium case, to keep your sharps box and stock secure. You’ll also be given more consumables that are required to deliver anti wrinkle treatments. Plus appointment cards to ensure you can remind clients when to retu for thir repeat appointments. The after care information is a great way to help clients to remember what they should and shouldn’t be doing post treatment. The Gold Starter Kit eliminates the pondering over which fillers to buy, and the dilemma of where to buy them from until you feel you get to grips with all of the suppliers in the industry. So we have made up a great Gold Starter Kit to get you off on the right foot from the moment you leave us. As an extra thak you for attending our traiing courses, we have also included 2 x discount vouchers for Dermaroller and Advanced BTX and Advanced Dermal Filler Training. Have you completed your Basic Botox/Azzalure or Xeomin training. We have a Basic Botulinum Toxin A Training DVD, with fantastic close up shots of muscle movement and product placement to help you improve your injection techniques. Simple pay online here or call the office and we’ll ship it out to you the next day!